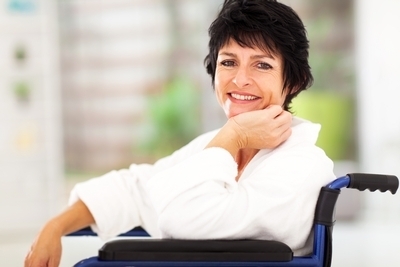 Studies have shown that women with disabilities are less likely to ever have a mammogram. And yet, their risk of getting breast cancer is the same as other women. Our goal at Ella Health is to make sure that all women over the age of 40 come in to get a mammogram annually as a part of taking care of themselves. We want you to feel welcome and comfortable here even if you use a wheel chair, need a special communication device or could use some guidance getting down the corridor. Our centers are designed to accommodate your needs and our techs understand how to help. We recommend that you let us know about your situation when you call to make an appointment. This way we can set aside extra time. We want to make sure you don’t feel rushed. We will plan to have two techs on hand to assist you as needed. We also recommend that you wear a two piece outfit with a top that is easy to remove. This will make it easier for you to prepare for the exam once you are here. We ask all women to remove deodorant or body lotions before the exam because they can interfere with the imaging. We’ll provide warm wipes for this. If you use a wheelchair, you can remain seated in it during the exam as long as the armrests can be removed so we can properly position you for the side views. If that’s not possible, let us know and we will work things out. If you don’t use a wheel chair but can’t stand for the entire exam, we can provide you with a chair. If you want to bring someone who can help you or just keep you company, please do. We know that the extra support can make a difference. Regardless of your disability, we will talk to you throughout the exam to let you know what to expect, answer any questions and make sure you are doing well. We want to make sure that you have a good experience so that you will come back again and continue to take care of your health.